Submitted by Norm Roulet on Thu, 05/27/2010 - 10:46. 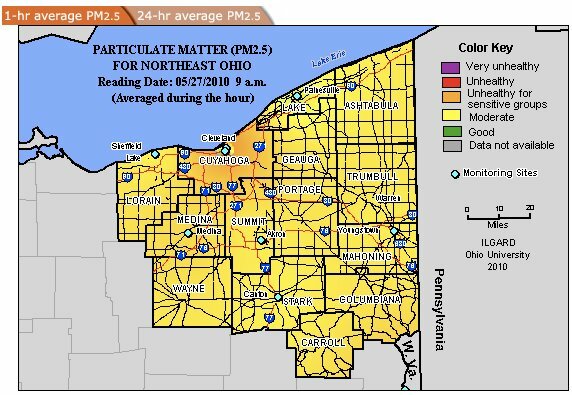 Northeast Ohio - Today's high temperatures and lack of wind may result in exceedances today for both ground-level ozone and fine particles. An Air Quality Advisory is in effect for today, May 27, only. Fine particle concentrations will be highest in urban areas, while ozone may be more widespread. Please "Check Today's Air Quality" at www.noaca.org to see live hourly monitor readings for your county, for both pollutants. If you have to perform vigorous outdoor activity today, please be careful if you have a respiratory or heart condition. A weak cold front is likely to move through the region on Friday, clearing the air. Today will be the second ozone exceedance for 2010 (the first occurred on April 15). It is the third fine particle exceedance for 2010 (the others occurred in January and February). * Tune up your car or truck. * Ride the bus or train every day this summer. "Check Today's Air Quality" at www.noaca.org because conditions change frequently. In Cuyahoga County, you can also call: CDAQ Air Quality Index Line 216-441-7474. The Northeast Ohio Areawide Coordinating Agency (NOACA) partners with the Ohio EPA, the Cleveland Division of Air Quality, the Akron Regional Air Quality Management District, the Akron Metropolitan Area Transportation Study, and the Lake County General Health District, in forecasting "Air Quality Advisories." Live monitor maps are provided through Ohio University. Submitted by westward on Thu, 05/27/2010 - 23:34. Your posting validates what I was experiencing earlier this morning, pain with breathing made a little better with shallow breathes until I got into the filtered air of the a/c. Quite a catch 22 here: We burn coal and gas, causing the pollution and ozone layers, and need to be in a place where we use a lot of electricity so that we can breath without the pain that is being caused by polluting our planet that generates the electricity to run the air conditioner. Submitted by Norm Roulet on Fri, 05/28/2010 - 00:46. I check the NOACA site regularly - especially when we have conditions like this... I'll be up there daily this Summer I'm sure. We will need to get some A/C as we need to filter our air as much as possible here. It's been rough breathing for a few days. We need to change how we love our lives. Coal is not the answer - having a steel mill in an urban center with poor air quality is not the answer. I expect in the coming months and years the people of NEO will become experts in coal and the environment as we have lots of learning to do, and deep science to debate.